Portrait Mask support! If you have an iPhone running iOS 12 which takes Portrait photos with the camera, Acorn will now detect and open up the Portrait Matte as a mask for the image! You can then enable this mask to block out the background and add fancy backgrounds or custom blurs for your image. New menu item to move a layer mask to a regular layer. Select the layer with the mask, hold down the Shift and Option keys, and choose the Layer ▸ Eject Layer Mask menu item. This menu is also available under the action menu of the main palette window, and in the canvas contextual menu. Drag and drop out layer masks! If you have a layer mask selected, you can now drag it out of the layers list into it's own layer or even move it to another layer mask. Hold down the Shift key to move it to a layer that doesn't already have a layer mask. Hold down the option key to make a copy of it. Hold down the shift key when clicking on a mask to toggle it on or off. Did you know? You can hold down the option key when clicking on a mask to toggle direct visibility of it. A normal click on the layer mask again (or any other layer) will turn it off. You can drag and drop a mask onto the trash icon to delete it. You can drag and drop a mask onto the + icon to copy it. When a mask is selected, pressing Command Delete will remove it. Exporting layers will now export the mask as well (via the File ▸ Export ▸ Export All Layers… menu item). And you now have the option to apply the mask on export. 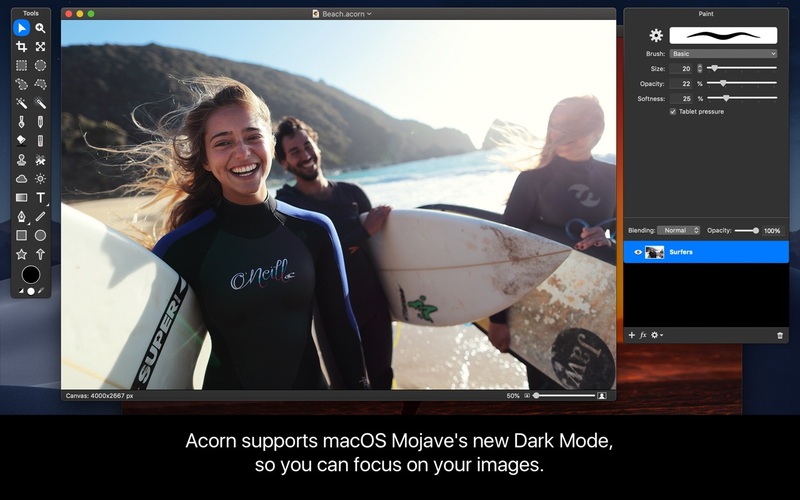 Acorn has a brand new brushing engine with much improved performance when running on MacOS 10.13 or 10.14 Mojave. A whole new category of "Basic Round" brushes ranging from 1px in size up to 5000px. Four new hand crafted bristle brushes. Saved brushes now have an opacity setting that can go along with it. The brush palette now has options for setting flow, softness, and the blending of the currently selected brush. Reduce the number of images used for PNG export, and save in file size! When exporting as a PNG you now have the option to "Index PNG Colors" which will reduce the bit depth of your image while also reducing the file size. Make an image that's 90% smaller than the original. Instead of rasterizing everything to a single bitmap layer which is then turned into a vector-less PDF, Acorn will now mix vector layers with bitmap layers. What this means is that you can have a fancy background imported from somewhere, and have text on a path (or circle) and other shapes that aren't turned into bitmaps which can look bad at lower resolutions. What you get now is a PDF that can be zoomed in and scaled, and all your shape layers will retain their sharp edges. This does mean that shape layers don't get to have filters on them though. Which is a bummer, but we think it's worth the tradeoff. Some blend modes are also not supported. But, we've got this instance covered with the next bullet point. Which is the next line below. Please read on. New "PDF (Rasterized)" option when exporting, enabled by holding down the option key when clicking on the options popup. This is the old behavior, where a bitmap image is created from your canvas and then stuffed into a PDF. Improved speed with 64 bit images on MacOS 10.14 Mojave! Now using visual effect views in the palettes, which lets the background color bleed in. However, if you have "Reduct transparency" turned on in the Accessibility System Prefs, then we'll skip the whole background bleeding in thing. Improved accuracy with the Curves filter. More precision when picking out colors on Retina displays with the canvas color loupe. Various MacOS Mojave UI fixes. Fixed a problem where web export of images with a layer which has a blend mode of Soft Light gives a preview that doesn't match the canvas. Fixed a problem where Acorn could quit unexpectedly when cropping an image. Fixed a problem where you couldn't control-click on a ruler to bring up the units contextual menu. Fixed a problem when using the Share menu in other applications to send very large images to Acorn. Next story Hedge 18.3.9 – The fastest way to backup / backup media. Previous story A Better Finder Rename 10.38 – File, photo, and MP3 batch renamer. PhotoScissors 4.1 – Easily remove backgrounds from photos. Adobe Illustrator CC 2015 19.1.0.29 – Professional vector graphics tool for Web and print. Redacted 1.2.2 – Hide sensitive details in an image.